Henry Coppinger of Miami, Florida, wrestled alligators for a living and for fun, although they outweighed and out‑grinned him. Henry was born in Miami, Florida in 1900 and grew up to weigh 130 pounds and stand 5' 9" tall. In 1919 when he was 19, he started an alligator farm near Miami to earn a few quarters from tourists. He and some Seminole Indians captured big alligators and caged them in tanks on his land by the Miami River in the Florida Everglades. These big alligators produced little alligators and Henry counted on selling the babies to visitors to take back to their northern homes as souvenirs. By now the babies were a month or so old and from four to six inches long. Just as Henry's alligator farm was about to open for business, a neighbor pulled the rug out from under him. The neighbor suddenly stocked his own place that was nearer the main highway with all sizes of alligators and out in front put up a big sign that said "Alligator Farm." Henry was left holding the bag of baby alligators. Henry held his temper and came up with an idea to make the tourists pass up the neighboring alligator farm. For many years Henry had been tussling and wrestling with small alligators, but now he decided to wrestle the big ones for the big time money. The alligators that Henry wrestled were big time too. They weighed from 300‑400 pounds and measured from six to ten feet long. Although both Henry and the alligators could swim, the alligators had the advantage of being born in the water and possessing a hide at least half an inch thick. The alligators had big teeth, at least sixty of them, from one-half inch to more than one inch long. These teeth were razor sharp and when the jaws closed down, they snapped a human leg like a toothpick. Alligators can see and hear as well as a humans. There is a method to wrestling alligators and Henry followed it carefully. He wanted to live to tell people about it! According to Henry, the first step in wrestling an alligator was to capture one, as big and mean as possible, and put him in a large, deep pool. Usually the alligator sank to the bottom of the pool and sulked and waited for someone to attack to relieve his frustrations. Next, Henry came to the pool in a bathing suit. He eased himself into a canoe and paddled softly out to the spot where the alligator pouted. He spotted the alligator on the bottom of the pool and dove into the water, straight at it. Henry swam swiftly, aiming for the alligator's rear. 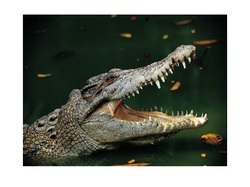 The alligator heard him and turned around, his eyes gleaming, his huge mouth wide open. Henry popped to the surface for a quick breath, then sank back to the bottom. This time, he approached the alligator from another direction. He quickly hopped on the alligator's back, grabbed its snout with his right hand, and with his left hand tightly held the alligator's left hind leg. Then the contest began. The alligator bucked, twisted and turned. He slapped his tail back and forth, trying to knock Henry off his back. The alligator tried to open his mouth, but Henry held it shut. When the alligator couldn't shake Henry off his back, he struggled to the surface of the pool. Normally the alligator spent hours on the bottom of the pool, but the wrestling match made him angry, so he had to come to the surface for more oxygen. On the surface of the pool, the battle continued. Henry grimly hung on. The alligator swung his tail around to smack Henry's body. The onlookers gasped at the sound, but it was just a sound. The alligator's tail was a few inches too far away to do Henry any harm. Henry and the alligator thrashed around in the pool. Henry played for time, knowing that the alligator's wild heaves and wallows would tire him out. The alligator kept trying to get Henry with his tail or teeth, but Henry rode him like a bronco buster and the alligator didn't get his chance. Minutes ticked by and the tired alligator stopped for a rest. Henry acted quickly. He had worked the alligator near the empty canoe and with a quick motion, he threw the 200 pound alligator half over the canoe's side. Another quick shove and the alligator was over the side and resting on its back on the bottom of the canoe. Henry gripped the alligator's snout with one hand. With his other hand he gently stroked the alligator's yellowish belly. In a few seconds the alligator was snoring. The massaging of the sensitive nerves running near his stomach had put him to sleep. The entire match, including the alligator nap, took about 17 minutes! By the time he was 29 years old, Henry had earned a reputation as "The Alligator Boy." During his seven year alligator wrestling career he had man- handled 500 snouts of 500 alligators without being eaten. And he estimated that he had won all 500 matches he wrestled with a few narrow escapes. He fought his 500 alligators in ornate swimming pools and especially constructed tanks, while thousands of thrilled spectators watched. "But I single handedly captured most of them in their own back yard, the Florida Everglades," he said.